BJP leader Mahesh Sharma, 59, won 50% of the votes in 2014--a margin of 23.37% over his nearest rival from the Samajwadi Party. He hoped to re-create that result. Clouds of dust flew into people’s faces as the next white SUV full of Bharatiya Janata Party (BJP) karyakartas (workers) drove up to the maidan (ground) in Sutyana village, 56 km east of India’s capital. On a recent March day, protesters and party workers gathered for an election rally of union culture minister Mahesh Sharma, BJP member of parliament (MP) from the Gautam Buddha Nagar constituency. Sharma, 59, won 50% of the votes in 2014--a margin of 23.37% over his nearest rival from the Samajwadi Party. He hoped to re-create that result. It was a BJP yuva morcha, or youth event, and they were getting louder. It was 12:20 pm, mantri-ji was expected any minute. But instead of the 2,500 people anticipated--for whom adequate chairs, microphones, megaphones and posters had been arranged--there were no more than 50. With a right-wing Hindu party in power appealing to the majority vote, this is the first of a six-part series that explores the Hindu vote from India’s most important battleground state: UP, home to 80 of 543 Lok Sabha constituencies or 14% of Parliament’s lower house. A state that is 79.7% Hindu and 19.2% Muslim, according to Census 2011, UP is where the Hindu right first gained ground with the demolition of the Babri Masjid in 1992, and the movement to construct a Ram temple in Ayodhya began. Gautam Buddh Nagar--84.6% Hindu--is crucial to the story of UP. These opportunities are important because UP has India’s second-highest fertility rate, which means it will keep adding young people. That means its window to exploit its demographic dividend--the economic growth that accrues from a young population--is likely to be “fully open” till about 2050, according to a 2018 United Nations Population Fund (UNFPA) study. A year after minister Sharma won his 2014 election, this constituency also witnessed the first mob lynching since the Modi government was sworn in. Mohammad Akhlaq was killed on the September 28, 2015, in a village in the Dadri segment of Gautam Buddh Nagar because a mob believed he had killed and eaten a cow. Since 2014, 11 people have been lynched in cow-related hate crimes in UP, 73% of them Muslim, the highest number of such attacks in any Indian state, according to a database run by FactChecker.in. The man saying this also belonged to the BJP’s parent body: the Rashtriya Swayamsevak Sangh (RSS). Once upon a time, his plain speaking had prevented him from getting a ticket to contest an election. Now, he sat in a tiny party office, in front of posters of the founders of the RSS--KB Hegdewar and his immediate successor, MS Golwalkar. In the local Rajput settlement, there is a large electricity transformer at the head of the street. On the night of September 28, 2015, an announcement had been made from the village loudspeaker that the carcass of a dead calf had been found nearby. The transformer is not anywhere close to the Muslim neighbourhood where Akhlaq once lived, but in these parts, the save-the-cow campaign is strong emotional currency. In the state elections of 2017, the MLAs contesting from the assembly segments of Noida and Dadri, which are part of this Lok Sabha seat, won by larger margins of 40.89% and 30.2%, respectively, a substantial bump up from the 23.37% lead Mahesh Sharma had in the Lok Sabha election in 2014, before the lynching. This is significant because of the way the caste math works in UP. Although the government has not made caste census figures public, various reports quote National Sample Survey Office and panchayat data that show more than 40% of UP is made up of other backward classes (OBCs), which have traditionally voted for the Samajwadi Party, also known locally as the Yadav-Muslim party. The BJP won Jewar in the state election of 2017 by a much lower margin than Noida and Dadri--the lead was 10.49%. Since then, various parts of the constituency have been roiled by farmers’ protests. There was dissent and anger around Gautam Buddh Nagar and BJP watchers, including those who voted for Sharma the last time around, were wondering if he would get a ticket to contest. But the terrorist car bomb that killed more than 40 Central Reserve Police Force (CRPF) troopers in Pulwama, Jammu and Kashmir, on February 12, 2019, turned the tide, according to some party workers. Back at Mahesh Sharma’s rally in Sutyana, it was 2 pm. Sharma had been expected to arrive at 12.20. The youth leaders had to prevent the few hundred who had been mobilised from leaving. One youth leader came up and made a rousing speech about the benefits of demonetisation, the voiding of 86% of India’s currency by Modi in November 2016. “Caste will be a big factor in this seat,” said a tall, lanky man in glasses, a self-confessed BJP supporter at Sharma’s rally. He explained what he meant: “Mahesh bhai is an outsider to UP. He is from Rajasthan. 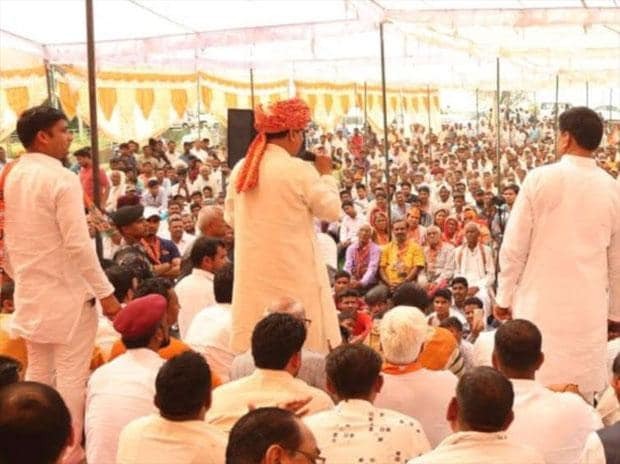 And there is a huge outsider population [in Noida] that will vote for him and that will mitigate local caste factors.” By local caste factors he meant Gujjars, a pastoral community that are Hindus in UP, who observers said are likely to vote for the Gujjar candidate from the opposition party, the Bahujan Samaj Party (BSP). The task handed to him in his internship was a test of this resolve. He was asked to design a Swachh Bharat campaign. “I was feeling a bit awkward about this, that I had to do jhaadu [sweep] on the streets,” he said, peering into his coffee. Mishra and his family are migrants from Jharkhand, a state poorer than UP, but belong to an “upper” caste. To do the job of “lower” castes was difficult. “So, I thought I would pick an area far away from where I live and set out at 4:30 am, when nobody was watching,” he said. By 3.20 pm news filtered in that Sharma was not going to show up at the rally, after all. Party managers quickly found another leader to garland and declared the rally a success. The drummer left. The maidan was full of empty plastic glasses, as the last SUV sped away. This is first of six stories exploring the Hindu vote in Uttar Pradesh.